At the start of last offseason, Ryan Madson had big dreams. For a time, it appeared he was on the verge of signing a big four-year contract. He didn’t, ultimately having to settle for a one-year contract, and then he missed that one year in its entirety after sustaining a torn UCL. Tommy John surgery completely wiped out Madson’s 2012. The Angels had big dreams, too. They signed Albert Pujols, they signed C.J. Wilson, they announced the terms of a massive new TV contract, and they set their sights on the World Series. The Angels didn’t even make the playoffs, even though the playoff pool had expanded by 25 percent. The Angels missed the playoffs in part because of their inconsistent bullpen. So there’s a certain appropriateness to the Angels and Madson now coming to a contract agreement. Madson re-entered the market as a free agent after not pitching, and though he still has to pass a physical, and though we still don’t know of the terms, it sure looks like Madson’s joining the Angels for a year and a low base, with the usual incentives for a player in Madson’s position. We’ve known that Jerry Dipoto wanted to give his big-league bullpen a boost, and the Angels have been rumored to have interest in any number of relievers over the past few weeks. Dipoto also isn’t a guy who believes in giving relievers gigantic contracts, so he’s always in search of a better value. The Angels attempted to bring in a new closer in Carlos Marmol before the Dan Haren trade fell through at the last minute. Without Marmol, the Angels kept looking for help, which led them to Madson. They didn’t have to look far. Madson’s from southern California, and that’s where he still lives in the offseason, so it wouldn’t be a surprise to learn that that played a role in his decision. There’s also the matter of the Angels offering a closing job, which would allow Madson to re-establish his value for the future. Madson had spoken with the Phillies, but the Phillies already have a closer, not to even touch on all the Madson/Phillies drama from last year. For the Angels’ part, Madson is cheap, and he’ll get more expensive only if he’s pitching well. And Madson’s surgery was performed by the Angels’ own Dr. Yocum, with Angels doctors apparently overseeing his rehab, so the Angels should have a good idea where Madson stands, physically. They shouldn’t be in for any surprises, unless they are, since pitchers are so frequently surprising. Ask the 2012 Reds if they were taken by surprise! There’s so little here that seems like it needs an in-depth analysis. Madson’s only 32, and when he’s been healthy, he’s been good. In his most recent season, he generated 16 walks and 62 strikeouts, with half of those walks being intentional. He’s a righty capable of pitching decently well to lefties. We understand that, at this point, Tommy John surgery works as more of a delay than anything else. Madson’s not a guarantee, but the presumed incentives minimize the Angels’ risk. Madson should make the Angels’ bullpen better with the caveat that relievers are unpredictable, yada yada yada. Anybody could write this paragraph. To me, though, there’s one thing, one other thing, most certainly worth some attention. It has to do with Joe Nathan, who isn’t Ryan Madson at all. For Nathan, 2011 wasn’t a complete mess, but it was a partial mess. 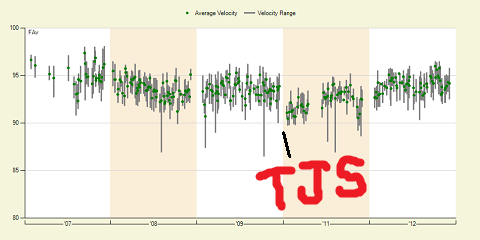 In the final month of 2009, Nathan’s fastball averaged 94 miles per hour. In April 2011, it was under 92. In May, it climbed, but not by much. Nathan went on the disabled list at the end of May with elbow and forearm inflammation. At that point, he had an ERA in the 7s, with nine walks and 15 strikeouts. He came back a month later and from then on, it was all peaches. Lots of strikeouts, limited walks. Mostly recovered fastball, except toward the end. Nathan, in the following 2012, was great. Because of the job, and because of the spring-training surgery, Joe Nathan is a convenient recent comp for Ryan Madson. It’s not a perfect comp — what happened with Nathan isn’t guaranteed to happen the same way with Madson — but what happened with Nathan suggests that the Angels would be wise not to count on Madson for that much out of the gate. There could always be setbacks, and there could always be rust. Though the Angels should have a good idea of the health of Ryan Madson’s right arm, he might just need to build himself up. He wouldn’t be the first. Thankfully for the Angels, they do have some bullpen depth. Plenty of people have highlighted their inflated number of 2012 blown saves, but the Angels have this guy named Ernesto Frieri, and he’s solid when he’s not giving up dingers. He did wear down in the second half, but he was still generating strikeouts like a crazy person, so Frieri could probably handle the closing job at the outset if Madson needs a little time. Or Scott Downs could, or Kevin Jepsen could, or Jordan Walden could. To be honest, the 2012 Angels’ bullpen wasn’t characterized by a lack of talent; rather, it was a problem of results, and things were probably going to get better regardless. Madson should just help them get more better, once he’s good and ready to go. The Angels are probably going to be pretty good. A healthy Ryan Madson is pretty good. Though Madson might not be 100 percent out of spring training, he can at least probably help the Angels down the stretch. Then, whether or not the Angels accomplish what they set out to accomplish, Madson’s one-year contract will expire. Have you ever thought about how baseball relationships are weird? Baseball relationships are weird. We hoped you liked reading Ryan Madson: Bounceback Player for a Bounceback Team by Jeff Sullivan!